3.9 out of 5 based on 68 bloggers and 18 commenters. Greetings is a free blogger template with 2 columns, right sidebar, an exclusive design for Blogger, footer columns, social bookmarking icons, posts thumbnails, pagination, related posts support, well designed threaded comments, vectorial elements and vintage style. I cannot see my RELATED POST on my blog post. Please help me. Thanks. Hi there, where is Posted by, Date, and number of comments? Why is that not included in this template? I want to download this template but I would like those options under the Post title please. 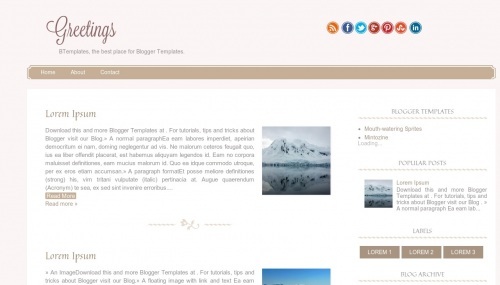 The template allows you to add any gadget or edit blogger’s given features. Once you upload the template go to your layout and click on edit situated on left for blog post. It will let you pick date and time. Nevermind I deleted the template as there is no support for any questions concerning everything that is wrong with this template. Word of advise to anymore, not to install. How to Change Header Title Font, Size & Color? I can’t delete the ‘related posts’ widget or box subscription by e-mail that appear below each entry…is there any way to do it? And how could I change the font and colour for the text in the tabs? Why can’t I change the fonts and stuff? I would like the blogname on my banner to be in the same type of text as in the preview. How do I do this? thks for share it ..
so nice very good job..
Haaji Gulfaam askd its is a very nice site..